Submitted by Mason Hoberg on Dec. 22, 2017. 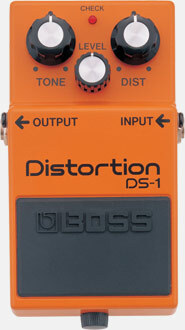 Because distortion is such a widely used effect, most guitarists’ first pedal ends up being a distortion box. Most guitarists start out with something simple, like the famed Boss DS-1, but over time invest in a pedal with more controls and flexibility (and a higher cost). Thanks to this ever increasing demand, there are now tons of options available. Here we take a look at the best distortion pedals that are currently available, to help you find the right distortion pedal for your musical style and budget. 91 out of 100. Incorporating 80+ ratings and reviews. 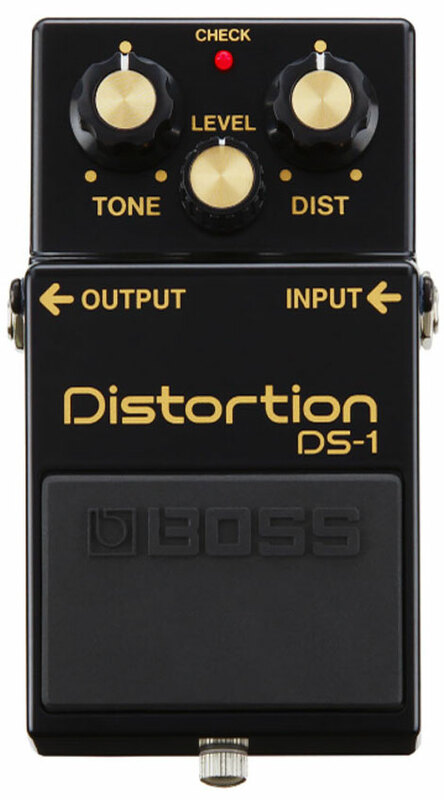 The Boss DS-1-4A is a reproduction of the early Boss DS-1 pedals launched by the company. The main reported difference between the new and vintage versions of the pedal is that the vintage pedals (which is what this pedal is based off of) have a warmer tone when compared to the mid-range hump of the modern DS-1. Though an unassuming pedal at first glance, the Boss DS-1-4A is a pedal that has been used on some of rock’s most famous albums. And though the pedal may seem relatively minimalistic in regard to its controls, its actually a lot more versatile than you would first assume. The pedal can range between garage rock, grunge, and hard rock with ease, as evidenced by its widespread use across countless genres. Boss pedals are also amongst the most durable made, making them a great choice for musicians who aren’t looking for gear they have to baby. The chassis and components within are all built to last, meaning that this pedal will likely last you as long as you choose to use it. 90 out of 100. Incorporating 1150+ ratings and reviews. The RAT 2, like the Boss DS-1 above, is a surprisingly versatile distortion pedal. Though it leans more to the “fuzz” side of the spectrum than many pedals featured on this list, the pedal is still capable of everything from light overdrive to heavy levels of distortion. The main characteristic that divides the RAT 2 from other pedals on this list is that, as mentioned above, it has somewhat of a fuzz tone. Fuzz, while similar to distortion, is actually a notably different effect. For a good example, thing of Jack White’s tone vs classic rock. 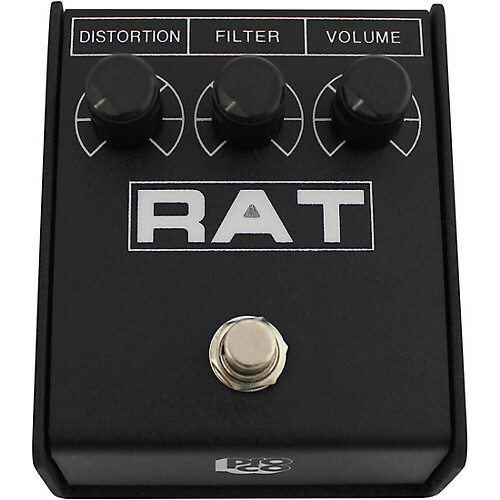 The RAT 2, while leaning more towards the distorted side of the spectrum, still has the extra frequency response that defines fuzz. Lastly, the RAT 2 is also true bypass. True bypass pedals let your signal pass through the unit unaltered when the pedal isn’t engaged, which helps your signal to retain clarity. This is especially important if you plan on using multiple pedals. 91 out of 100. Incorporating 800+ ratings and reviews. 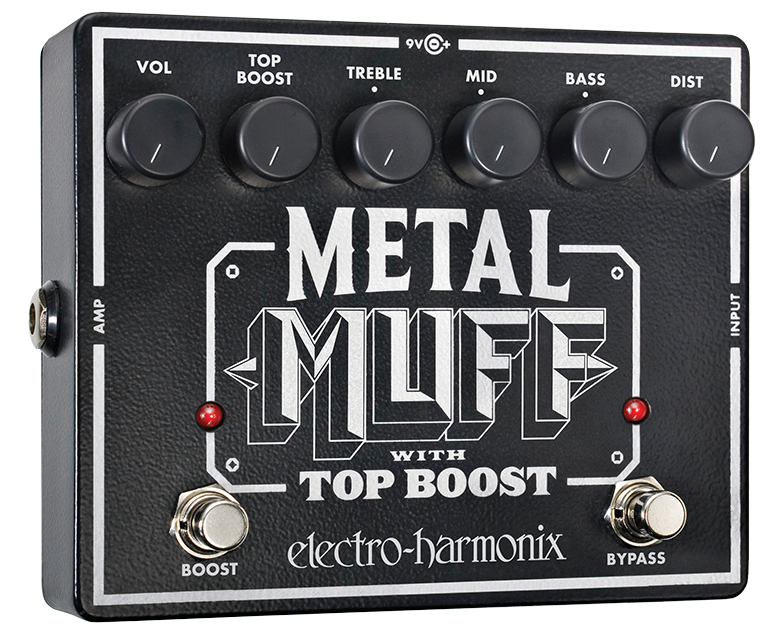 The Electro-Harmonix Metal Muff Distortion Pedal with Top Boost is exactly what it sounds like, a Big Muff Pi geared towards metal and hard rock players. Though the pedal definitely invites comparison to the more well-known Big Muff Pi, it should be noted that this pedal is a very different animal. The pedal can best be thought of as a metal distortion first and a fuzz second, giving you the focused distorted tone you find in metal with the grit you find with a fuzz pedal. It’s great for metal players looking for a unique lead and rhythm tone, but don’t think you’re going to get a great metal tone and a perfect Big Muff tone. A cool feature of this pedal is the top boost, which helps to both increase the gain and tame some of the low-end you get with Big Muff style pedals. 90 out of 100. Incorporating 800+ ratings and reviews. 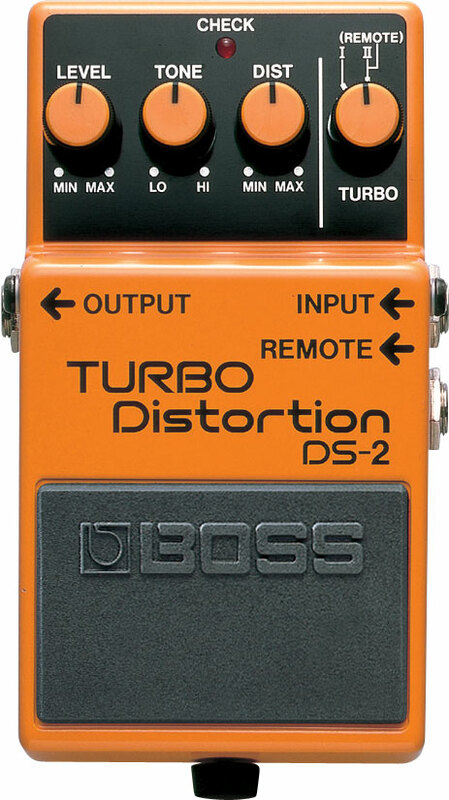 The Boss DS-2 is an upgraded version of the DS-1. It’s essentially a DS-1 with an additional gain circuit built in. Picture it like this, imagine you have a normal distortion pedal. What’s going to happen if you use a second distortion pedal at the same time? You’re going to get more distortion, right? That’s essentially what’s happening with the DS-2. The cool thing about the DS-2 is that you still have access to the same basic tones as the DS-1, but you also have the option to use higher levels of gain. This is why many users of the DS-1 eventually purchased a DS-2 as well, because it has a similar tone (the tone of the two pedals is close enough that many would have a hard time distinguishing between the two) and the option of more distortion. The DS-2 also has a special feature that many pedals in this price range lack. When using the pedal with an optional footswitch from Boss (like the FS-5L) you can switch between the first and second gain stage without having to bend down to adjust the pedal. 90 out of 100. Incorporating 1400+ ratings and reviews. 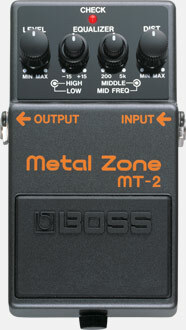 The Boss MT-2 Metal Zone Distortion Pedal is a very controversial unit. It’s a love it or hate it pedal. Some musicians feel that it sounds harsh and tinny, while others feel that its their key to high gain awesomeness. So why does the MT-2 get this reputation? Well, it’s actually pretty simple. The pedal makes it really easy to entirely scoop out your mid-range frequency response. Since the guitar is a mid-ranged focused instrument, and it’s focus in a mix is mid-range, when you cut out your mid-range your tone gets flabby and weak in a band. So long as you don’t cut out your mids, the pedal has the potential to sound just as good as any other high gain stomp box. The only thing to keep in mind with this pedal is that the EQ makes a huge difference with this pedal, so expect to take some time to dial in the tone you’re looking for. So with that out of the way, when you look at the pedal on its own merits it really is a fully featured little unit. The MT-2 comes with a three-band EQ, allowing you to adjust your low-end, mid-range, and high-end frequencies. There’s also plenty of gain on tap, so if you’re looking for hard rock and metal tones you’ve come to the right place. 91 out of 100. Incorporating 175+ ratings and reviews. The MXR M75 Super Badass Distortion Pedal is arguably one of the most versatile distortion pedals currently available, being able to cover everything from sweet overdrive to pounding hard rock. The key to the pedal’s versatility lies in the range of its distortion and its three-band EQ. These two features together make it possible to dial in a ton of different gain profiles, all of which are pretty convincing in their own right (though nailing a certain tone is also heavily dependent on your amp). The MXR 75 is also true bypass and analog. True bypass is a bit of a buzzword, but it is definitely preferable to hardwire bypass if you’re looking to maintain your original tone. 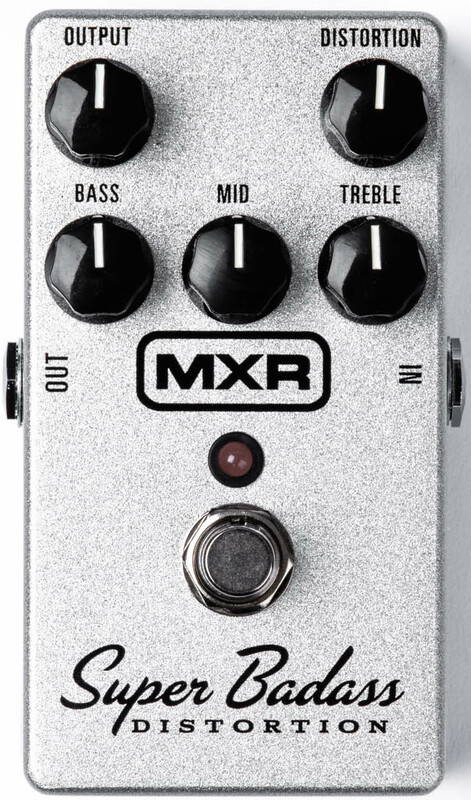 The analog construction is less important due to the advancements made by digital units, but the MXR 75 does feature the warmth and organic tone associated with analog pedals. The Wampler Sovereign Distortion Pedal is a tweaker’s delight, allowing musicians to dial in a ridiculous variety of different gain tones and responses. The pedal owes this to its vintage/modern and boost/gain switch. The vintage/modern switch allows you to select either a vintage or modern gain profile, as implied by the name. However, what makes this switch so valuable is how accurately it accomplishes what it sets out to do. It’s essentially like having two different pedals in one. 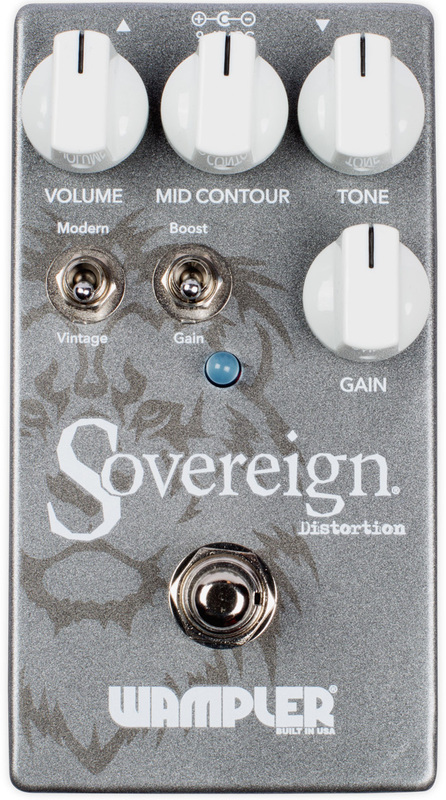 Interestingly, the Sovereign also includes a clean boost setting. Basically, this lets you use the pedal as a boost without any additional distortion. When used with tube amps, this creates more tube distortion without adding in distortion from the pedal itself. Lastly, the pedal also comes with a mid contour switch. This switch changes the mid-range response of the pedal. Though the pedal doesn’t come with a full three-band EQ, the mid contour control does offer a lot of control over your tone. 89 out of 100. Incorporating 2450+ ratings and reviews. The Boss DS-1 is a staple among electric guitar players, used by some of the most important rock acts in history on some of the world’s most influential albums. The question is: what makes this unassuming orange box so special? When looking at the pedal without considering its reputation, the key thing that stands out is its response. The pedal is simple to dial in, and you’d have to actively look for an objectively bad tone out of it. The distortion has a smooth increase and the EQ (while minimalistic) is effective in dialing in the frequency response you’re looking for. The only thing that some may find lacking in the pedal is that it doesn’t give you as much control as some of the pedals above. However, its simplicity may actually be a selling point depending on what tone you’re looking for. It’s a true plug and play pedal, which is great if you don’t want a pedal that you have to invest time in to get a good tone. Fulltone effects are arguably some of the best received pedals on the market. Pedals produced by the company have graced the pedal boards of some of the world’s most prolific musicians, due to their rugged “built to last” construction and their organic tone. 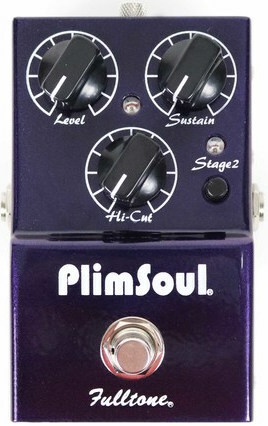 No exception to this trend, the Fulltone PlimSoul Overdrive/Distortion Pedal is a phenomenal unit. The first thing you need to know about this unit is that it does change your overall tone. In the manufacturer’s own words :…PlimSoul has a gorgeous enhanced mid-range and lower mid-range.” It’s not a transparent unit, so if you want to keep your amp’s tone relatively unaffected you may want to skip this pedal in favor of the OCD (if you’re looking to stick with a Fulltone pedal). The way this pedal integrates overdrive and distortion is also pretty interesting. The overdrive section of the pedal uses soft-clipping, which sounds more like a tube amp. The distortion (which is hard clipping) is dialed in with a small knob, allowing you to blend soft and hard-clipping. This opens up a ton of different tones that are hard to achieve with other units, giving the pedal a versatility that can be hard to match. Wampler’s Hot Wired V2 Overdrive/Distortion Pedal has a very warm and balanced voicing, both on its overdrive and distorted channels. Like the Fulltone above, the Wampler Hot Wired V2 also allows you to blend the overdriven and distorted channels together, opening up a whole new world of tone. The cool thing about this pedal is that you get individual controls for volume and tone on both channels. This makes it easier to switch into different tones. You can have a smooth distorted tone for rhythm, and then use the overdriven channel to pump up the volume, gain, and high-end for solos. 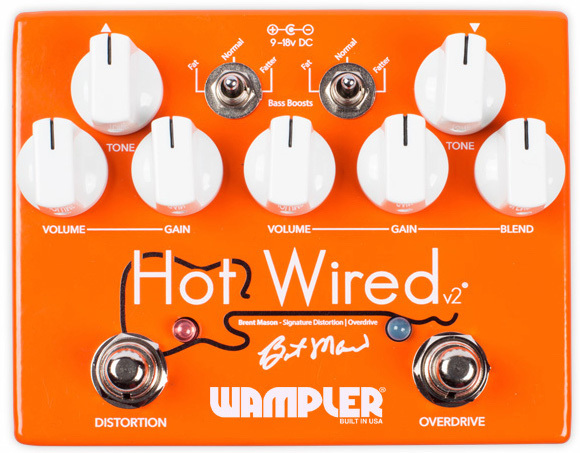 Something that makes this pedal especially attractive for musicians who use single-coil equipped guitars is the Hot Wired’s Bass Boost switches, which boost the pedal’s low-end signal response. This is great for single-coil instruments, which have the potential to sound a bit thin when used with higher levels of gain. 91 out of 100. Incorporating 60+ ratings and reviews. The Bogner Ecstasy Blue Overdrive/Distortion Pedal gives musicians everything they need to dial in their perfect tone. The pedal has a variety of controls which change the tone and gain profile of the pedal, allowing you to dial in tones that range from everything to a Fender Deluxe on the edge of breakup to a roaring Marshall stack. By far the most interesting feature of this pedal is the variac switch, which adds a dynamic compression to the signal. This is similar to the effect that a tube rectifier has on your tone, and for many musicians is the key to getting an organic and smooth distorted tone. The Structure switch changes the “era” of the pedal, shifting the EQ and gain structure to capture either vintage or modern tones. The mode switch performs a similar purpose, switching from a blues setting to tones approximating a Marshall. 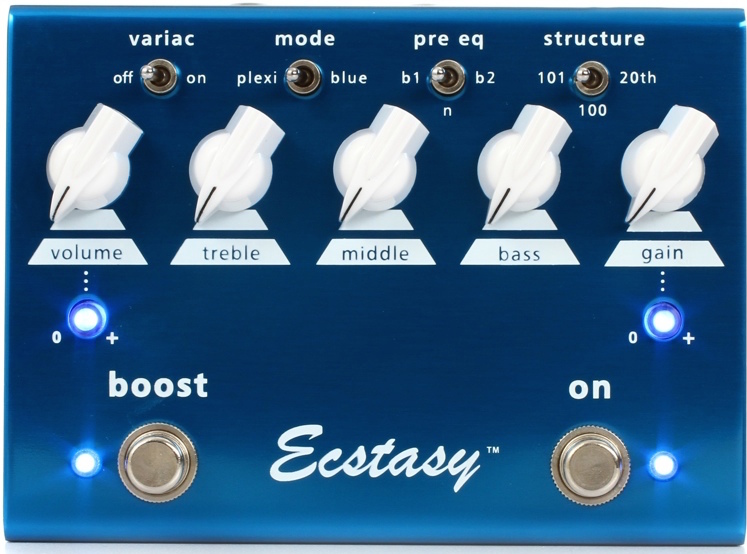 The Bogner Ecstasy Red and the Ecstasy Blue are very similar pedals, and one is going to be able to cover the majority of what the other can do. 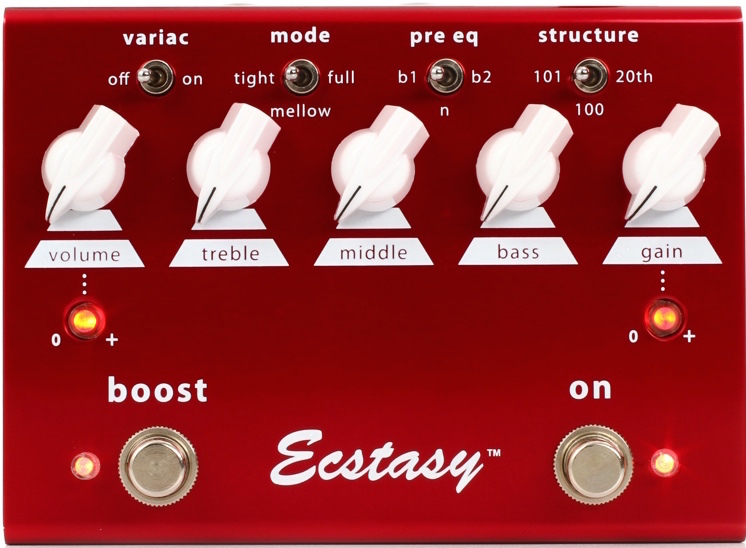 However, there is one key difference: the Bogner Ecstasy Red has more gain (distortion) on tap than the Blue. While this may not seem like a huge difference at first, its significant enough to justify the fact there are two different models of this pedal. The Red is capable of pumping out high gain modern tones (think a Mesa Boogie), but its light overdriven tones are a bit thinner than the Blue. It can still cover lighter gain tones, but you’re going to get better results with the Blue if you’re looking for lower gain tones. Beyond that, when it comes to the features of these two pedals they’re essentially the same. The mode switch here serves a similar purpose to the mode control on the Blue, shaping the EQ and gain profile. If you’re not sure how to figure out which distortion pedal is going to work best for you, or if you’re just looking to brush up on you’re background knowledge before you throw any money down, check out the specifications below. The most important thing to know when buying your first distortion pedal is that your amp is going to have a huge impact on how your distortion pedal sounds. If you are using a single-speaker solidstate combo amp, it will be hard to replicate the sound of artists who utilize expensive tube amp heads with 4x12 cabinets. If you’re looking for a super full and dark distorted tone, you’re going to want a distortion pedal that allows you to emphasize low-end and mid-range tones, or you can use a separate EQ pedal to achieve similar effect. While you can get reasonably close to a particular distorted sound, don't get too obsessed about getting to perfect - unless you can invest in other important factors like amps, cables, other pedals and most important of all - playing technique. As a general rule, guitar pedals emphasize one of two things: usability or versatility. Pedals that emphasize usability generally have less controls you can alter but have a great tone at almost every setting. Pedals that focus on versatility have more controls but require more tweaking to get the best possible tone. The best option depends on what you’re looking for. If you just want to plug in and get to playing, odds are you’ll be frustrated with a pedal that requires a lot of tweaking to get a good tone. Likewise, if you prefer having as much control as possible over your tone you’re going to want a pedal that will facilitate that. There are two configurations of pedal: digital and analog. The technical differences between the two are complicated and abstract, so for the sake of simplicity this section isn’t going to go too far in-depth. The main thing to know is that analog pedals are generally perceived to have a warm and full tone. On the other hand, digital effects are usually brighter sounding and has a bit more detail. There are good sounding digital effects and bad sounding analog effects. Don’t overlook an effect purely because its digital, and don’t assume an analog pedal is going to be your best option purely because of its construction. Terms you’re going to hear thrown around a lot when you’re looking for a pedal are: buffered bypass, hardwired bypass, and true bypass. These three terms describe what happens to your guitar’s signal when the pedal isn’t engaged. True bypass is where your guitar’s signal passes straight through a pedal unaffected, essentially making it the same as if your signal was just going through a cord. A lot of guitarists prefer this because they feel like it makes their tone more transparent. However, this isn’t necessarily the case. The main effect that true bypass has is that it shortens the overall distance your signal travels before it reaches your amp. This can help your signal maintain high-end response, because as the distance from your guitar to your amp increases you gradually start to lose high-end frequencies (this starts at roughly 18.5 feet, according to BOSS). However, true bypass doesn’t do anything to improve your tone. Buffered bypass is where the signal still passes through the pedal and its circuitry, but is boosted. This helps to strengthen the signal, and actually does more to preserve your signal than true bypass pedals. Buffered bypass pedals are especially helpful if you’re using a large signal chain (lots of pedals). Hardwire bypass is where your signal passes through a pedal’s circuitry and is not boosted. Hardwire bypass can cause you to lose some high-end response, especially if you’re using multiple hardwire bypass pedals. With so many distortion pedals in the market, gathering data on just the popular ones that are actually widely available was quite the undertaking. We focused on pedals that are actually labeled or marketed as distortion, excluding fuzz, overdrive and multi-effects pedals. Note that we did include dual distortion/overdrive pedals since they are in demand. Even with these limitations, we ended up analyzing over 40 distortion pedals, along with almost 14,000 data sources that include reviews, ratings, forum discussions and expert recommendations. Submitted by Nunya (not verified) on Sep. 16, 2018. Dude what the hell is this list? The DS-1 and Metalzone are some of the absolute worst distortion pedals with no midrange at all. Good luck trying to cut through a mix with those. The selection methodology is described above - note that the Boss DS-1 wasn't in our recommended list but included as an 'honorable mention' due to it's popularity and often being the first distortion pedal many guitarists try. The Boss MT-2 Metal Zone was included in our recommended list based on its high ratings, but if you read what we said again, you'll notice that we mentioned the controversy surrounding it in the first paragraph and went on to describe the mid-range issue in the second paragraph.